The range of leakproof and durable shower pods manufactured by Advanced Showers provide unrivalled flexibility when designing and fitting out modular buildings. Unlike conventional tile and tray shower units, they do not require tiles or bricks and mortar. This means they can be installed in literally any temporary or permanent design, with no concerns about installation difficulties. What makes our Shower Pods so suitable for Modular Buildings? In fact, you could consider shower pods to be modular too because they are made from GRP and delivered in either two sections or three sections that simply bolt together with a factory fitted gasket. The sections are easily manoeuvred through narrow openings and corridors so that they can be carried to the installation location without difficulty. Watch this short video animation to see how it’s done. What benefits do Shower Pods offer to Developers of Modular Buildings? Shower pods offer a simplicity of installation that off site construction processes need, combined with a leakproof guarantee that is good for their lifetime. There is more….. The attractive high gloss finish is exceptionally long lasting and does not suffer significantly over time even under extreme usage conditions. GRP is a very durable construction material that withstands wear and tear. The wide range of styles and dimensions means that it is easy to find a model to fit the space you have in mind. That range also means that there are models to suit every budget, from quite basic and simple units to top of the range models that impart a luxury feel. Shower pods are zero maintenance and totally leakproof, which is good news for facilities teams and makes for happy end users. Our bespoke option for volume orders means the architect need not be constrained to specific dimensions for shower units. Fast to install – this benefit really appeals to project managers who are risk averse and have an eye on agreed completion deadlines. A shower pod can be installed in a day by just one person. There are no tiles or other construction materials that might be delayed or run out. Furthermore, the fact that there is only one tradesperson involved reduces the risk of things going wrong and injecting delays. 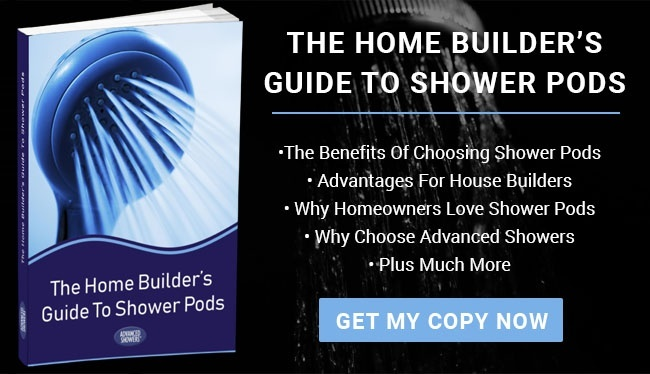 Download our free eBook The Shower Pods Guide, which is packed with information about how Advanced Showers Pods work, how they are installed and even more great benefits.